Mechanized doors in your home, like your garage door, require precise maintenance to remain in working order. When something goes wrong, simple, easy-to-implement solutions can save you time, aggravation, and money. The following are the most common garage door issues we come across, and easy ways to troubleshoot them so you can get your life back on track. Literally. You can also use a visual check to see if the door is hanging unevenly. If any cables or springs are suspended at uneven lengths, the garage door my get stuck due to imbalanced torque. Call your local garage door repair professional to fix cable or spring issues. 2. Uneven garage door that shimmies side to side: If your garage door opens unevenly, you may need to remove an obstruction or debris from its tracks. If you have cleaned out the tracks and the issue persists, check the quality of your springs, which should be the same length and stretch the same amount. On doors with automatic openers, the motors controlling both sides of the door may need replacement, so be sure to contact Ponderosa for an assessment. 3. Garage door falls quickly when lowering: Falling garage doors can cause great injury to you and your family members, so do not take this problem lightly. Most often, this issue is caused by broken cables or loose springs. Troubleshoot by closing the door and visually inspecting the apparatus. Consult an expert to help you replace garage door springs properly, without risking personal injury. 4. Loud noises: Screeching, grinding, or squealing coming from the garage door indicates an issue with track debris or lubrication. Use a gentle formula to clean the track. Be sure to use oil specifically designed for garage doors or a standard lubricant like WD-40. 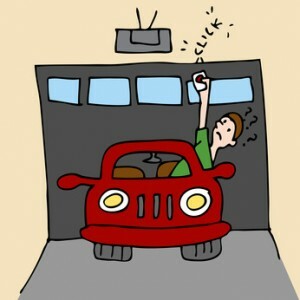 Once cleaned, run your garage door a few times to be sure it opens properly. Because your garage door is both the largest entryway in your home and the most mechanically complicated, treat all garage door issues with timely care. By calling a repair specialist, you can discuss any issues you may be having and find out if your situation can be improved using DIY techniques or the work of a professional.